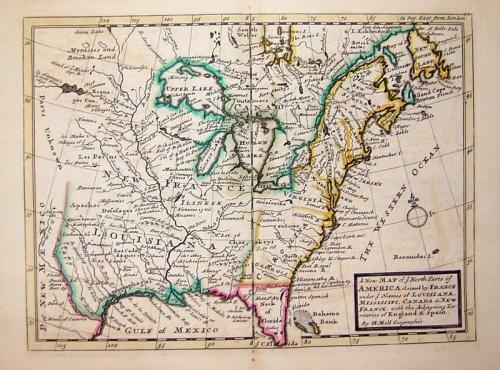 Full Title: 'A new map of ye north parts of America, claimed by France under ye names of Louisiana, Mississipi, Canada & New France, with the adjoyning territories of England & Spain'. By H. Moll Geographer. (Printed and sold by T. Bowles next ye Chapter House in St. Pauls Church yard, & I. Bowles at ye Black Horse in Cornhill, 1736?). The map is in very good condition with original colours and strong clean paper. There is some very minor foxing at the papers edge and a 1.5 cm bottom centerfold split that is well away from the image area.